It’s said that Toronto has only two seasons – winter and construction. And while we can’t do anything about the latter, taking a dip in a heated, indoor pool may help you ward off the winter blues. 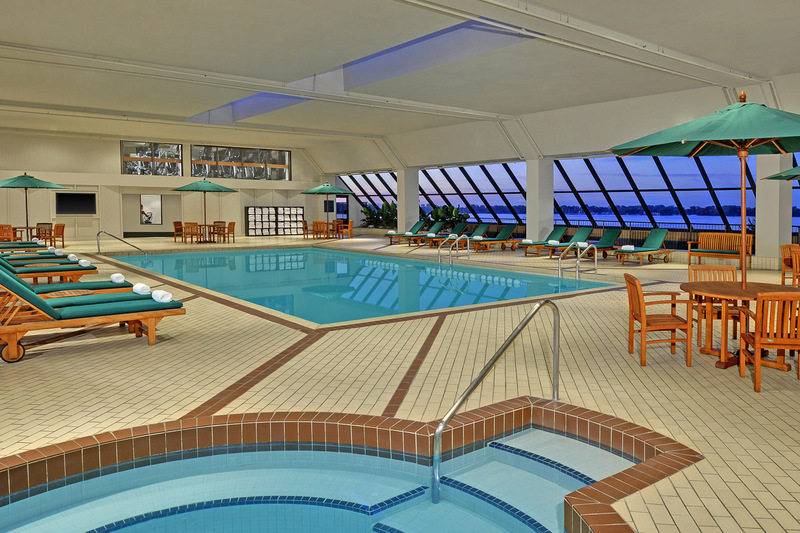 The following pools offer day passes for indulgent and indoor aquatic activities. 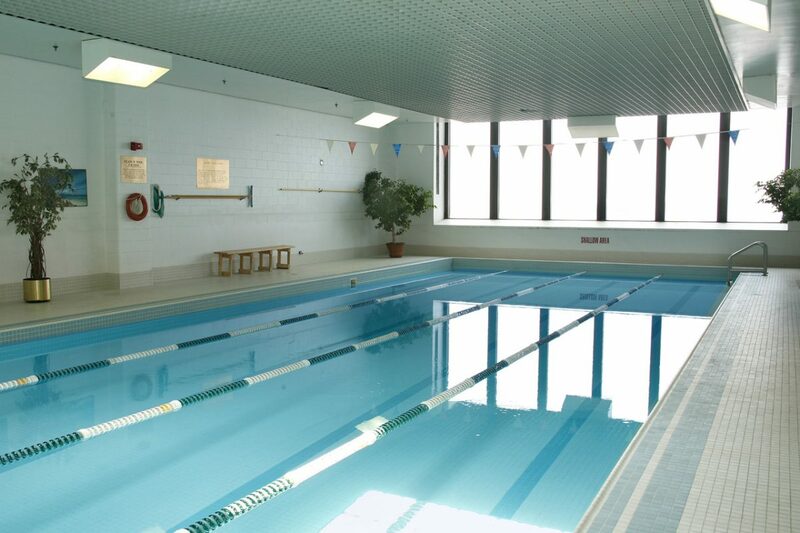 The Toronto Athletic Club does not mess around when it comes to their pool game. This airy “penthouse pool” is located on the top floor of the TD Tower, offering spectacular, sky-high views. In addition to swimming laps, the 4-lane, 25-yard pool hosts weekday drop-in group training workouts and triathlon-specific training sessions. Guests also receive access to the gym, group fitness classes and spinning classes. Locker rooms feature a full array of amenities, including a steam room, hot tub, showers, restrooms, TV lounge, towel & robe service, access to self-locking day lockers and a plethora of pleasing (and complimentary!) toiletries. Day passes available. Turn a dip in the tranquil Four Seasons Hotel pool into a mini, luxury retreat. This opulent, urban oasis is as blissful as it comes. The skylight ceiling and underwater music provides a serene setting for rewarding aquatic activity. Yes, a spa treatment is required to get access to the sunlit, indoor pool (how horrible is that, really? ), but it also allows full access to the eucalyptus steam room, rainfall showers, whirlpool and relaxation lounges. Day passes available with most spa treatments. 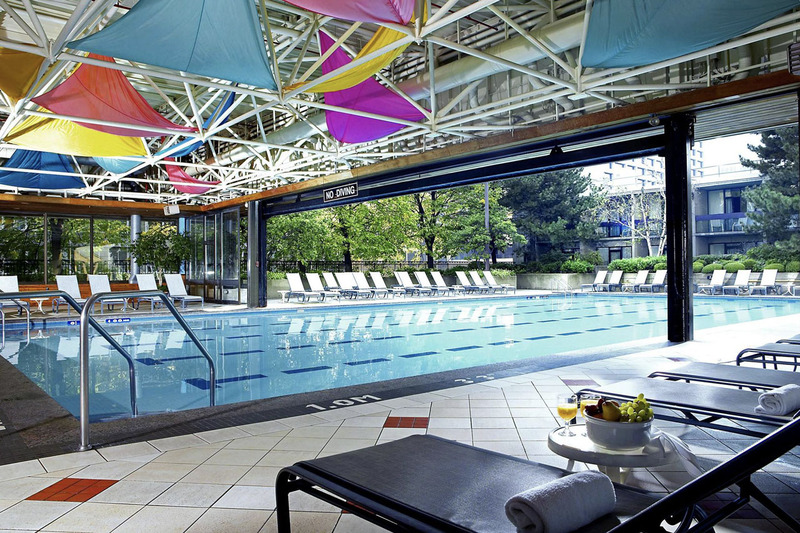 The Sheraton pool boasts the largest indoor-outdoor heated pool in town, allowing brave swimmers the chance to enjoy the outdoor ambiance and swim al fresco year-round by dipping under the protective glass. 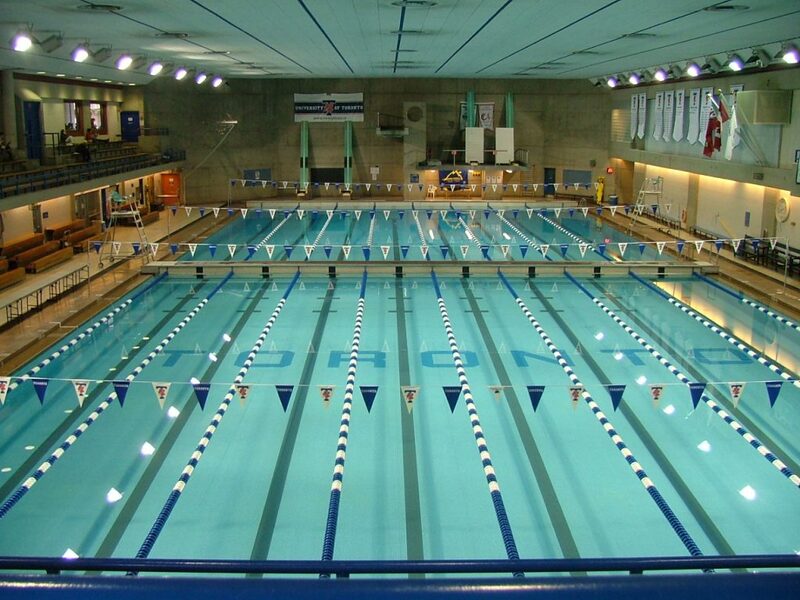 Swim some circuits in one of the two collegiate pools at University of Toronto’s downtown campus. Both the 25-yard and 50-metre (this one allows diving) pools offer lane swims, letting you get in some serious strokes. To keep your heart pumping, you’ll also get full access to the Strength and Conditioning Centre (SCC), Field House with indoor track, and drop-in activities like group fitness, basketball, volleyball, squash, tennis, and badminton. Day passes available. The expansive, heated, 50-foot long family-friendly pool is infused with light and has a designated lap lane. If you’d prefer a more structured way to get your swim sweat on, they offer Aquafit classes. Located on the 5th-floor rooftop, overlooking Lake Ontario, guests can enjoy breathtaking sunsets (you may even spot a Porter plane ascending from Billy Bishop Airport). Reward yourself post-swim and lounge on a plush, outdoor-inspired teak chaise and grab yourself a bite to eat. A whirlpool lets you enjoy a moment of pure bliss while soothing tired muscles. Day passes available. 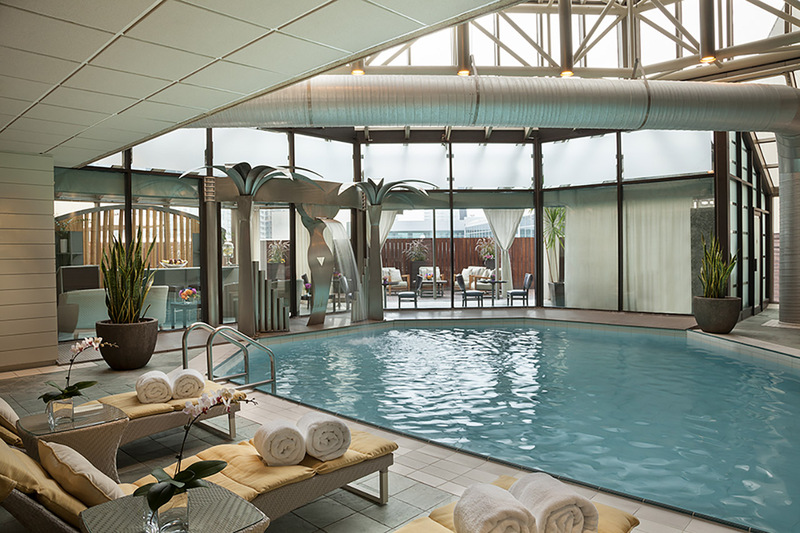 Access to this tranquil, 48-foot saline pool inside the Hotel Intercontinental also includes use of the salt hot tub and fitness centre, as well as complimentary robes, towels, slippers, and showers. Located on the third floor, the oversized windows provide lots of natural light, and its panoramic views give the pool a perennial sense of warmth. 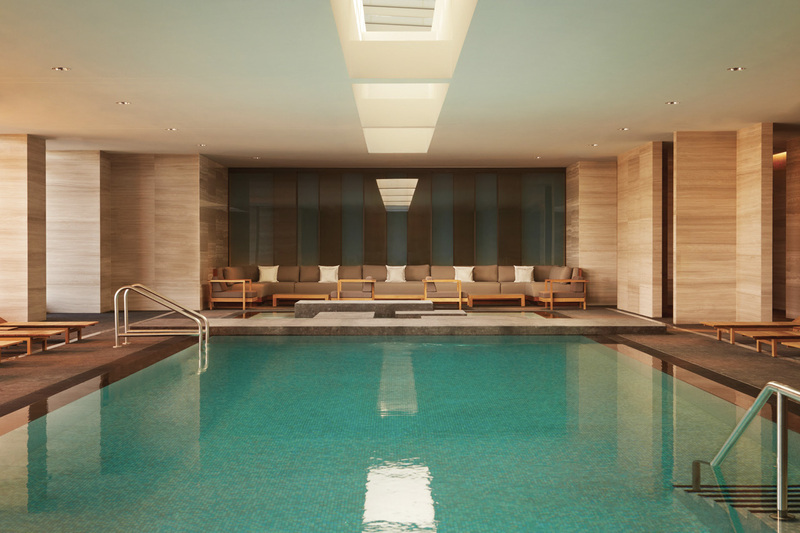 The pool, located in the AVEDA concept spa makes it tempting to add a treatment. Day passes available.